Solair power screens offer a full range of fabric options from opaque to see-thru mesh in a variety of style and colors. Screens can be motorized or manually operated. Indoor and outdoor models are available in many sizes. 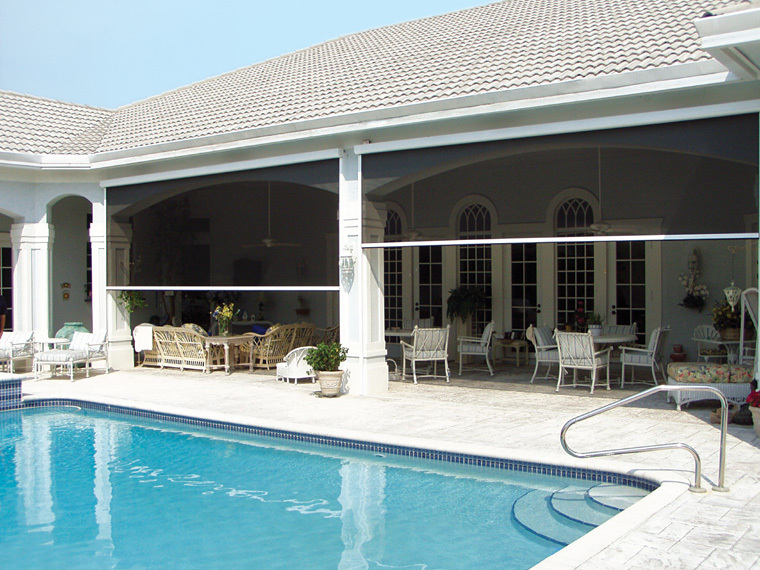 Outdoor screen systems feature a track on the sides to guide the fabric and front bar. This track system also minimizes unwanted movement in the wind. The tracks also help seal against insects. These screens can be motorized for operation by switch or remote control. Multiple screens can be controlled by one remote if desired. Indoor screen and window coverings are available in a full palette of color options and fabrics. These can also be manual or motor controlled, opaque or see-thru.Translucent fabrics are also available. See the details at each product page.